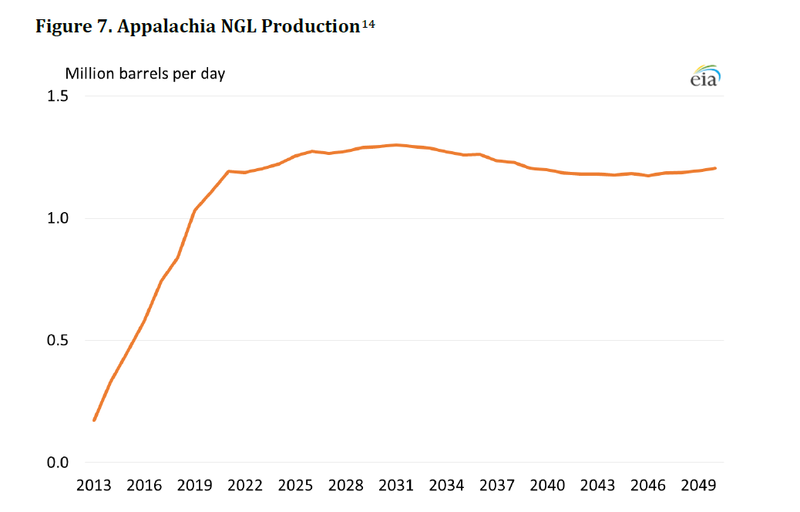 1) Staggering Appalachia NGL production growth expected in the years to come. DOE finds that NGL output will continue to grow through 2025 before plateauing and gradually declining by 2050. 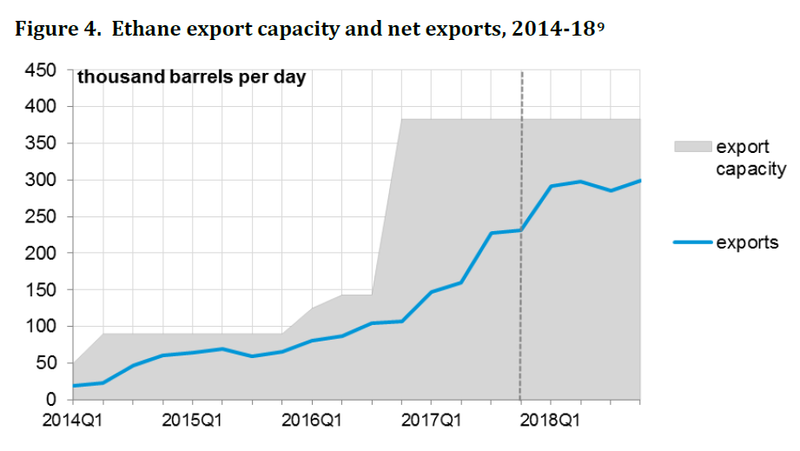 Over the course of the next 13 years, DOE projects NGL production will more than double and will eventually reach 1.2 million barrels/day in 2050. 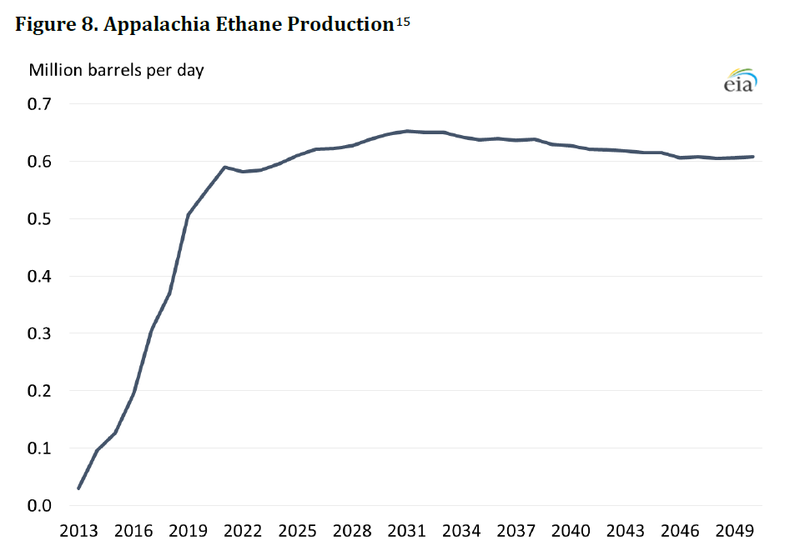 Ethane is slated to grow 20 times greater than regional ethane production in 2013, and propane forecasted to climb to 372,000 barrels/day by 2026! 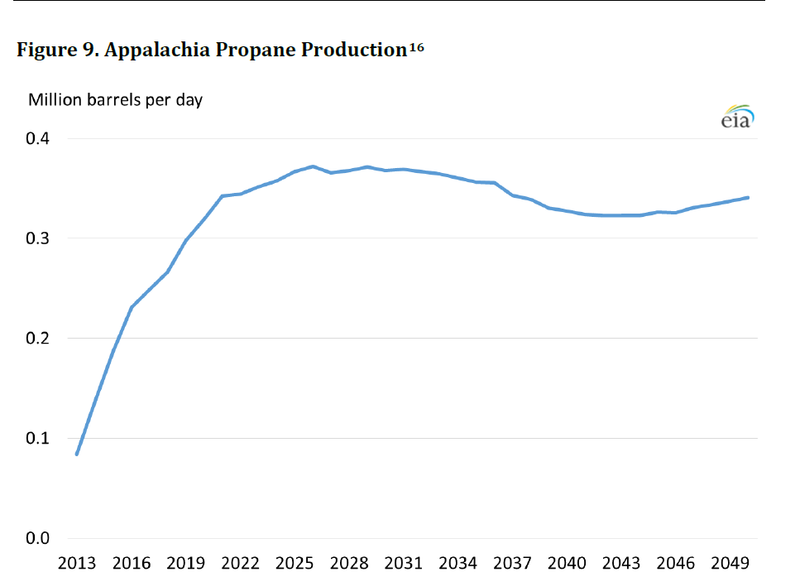 Propane production is also on the rise in Appalachia and nearly tripled in from 2013-2016. According to the report, annual production will rise to 372,000 b/d by 2026. 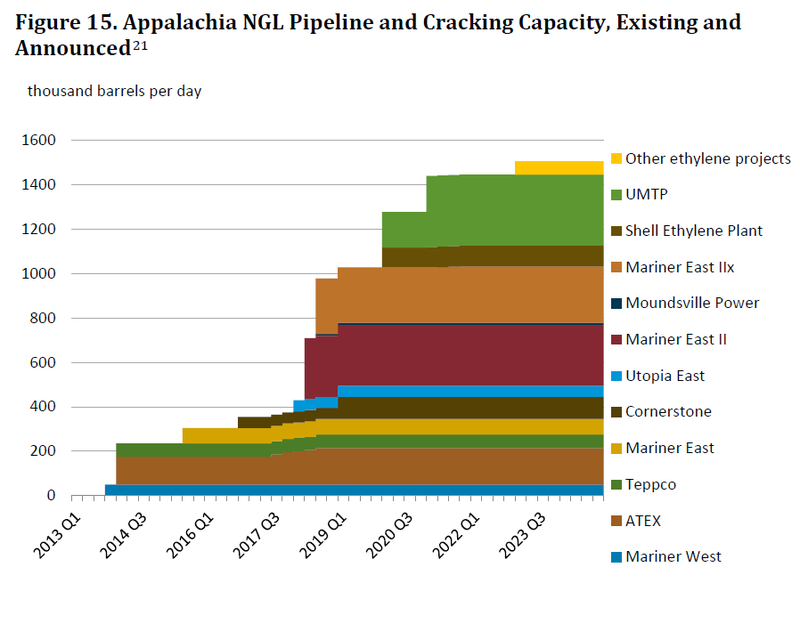 2) Appalachia NGL infrastructure is keeping pace, but we need storage to maximize local use. 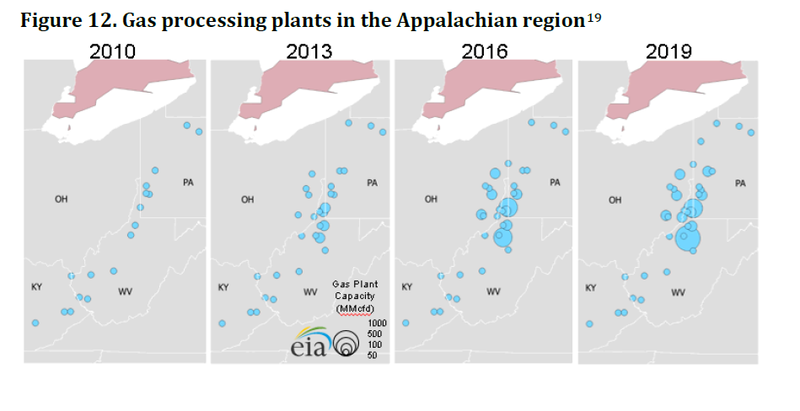 The report outlined the incredible growth of natural gas processing over the years, showing how modern, efficient processing plants have cropped up all across the region in Kentucky, Ohio, Pennsylvania, and West Virginia, growing by “nearly tenfold” from 2010. By 2016 natural gas processing grew to 10.0 Bcf/d, which has in turn accelerated production of natural gas and natural gas liquids. 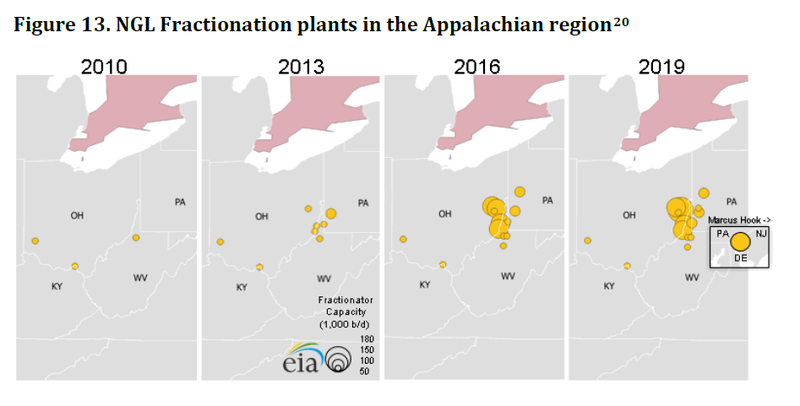 The chart below essentially shows that the region is about ready to experience a major change in both pipeline takeaway capacity and world-class petrochemical complexes, like the Shell Chemical Appalachia plant, which will use natural gas liquids locally. Together, these NGL pipelines and petrochemical plants will allow for a combination of massive local use of locally produced ethane and propane (through the cracker plants) along with exports to other regions of the country. ACC has found that by addressing NGL storage the region could see up to 100,000 permanent jobs. Storage will also help keep ethane and propane in the United States and, more specifically, in the Appalachian region. 3) Petrochemical projects are in early stages in the region and more end-users need to be identified. 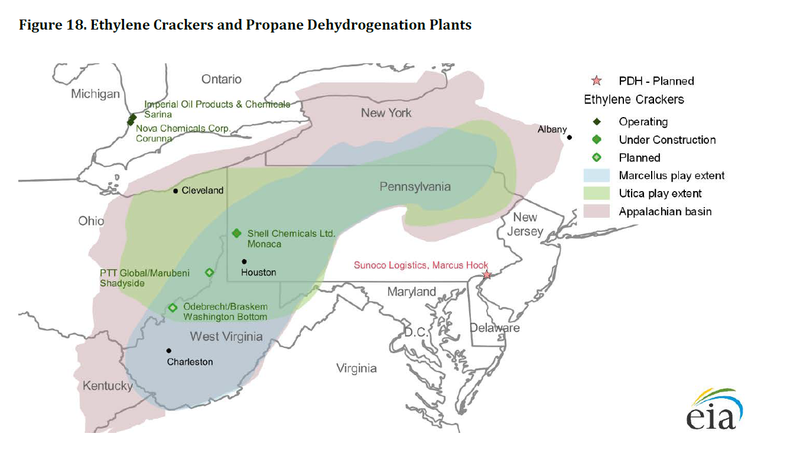 From processing to fractionation, the prolific natural gas liquids found in Marcellus and Utica shales must ultimately find a home, or end-use in the market. The end-use of these NGLs, of course, is found in over 6,000 consumer products, and after the raw natural resources makes their way through processing and fractionation, they must continue through a petrochemical process (ethylene crackers) where natural gas liquids are converted to usable product for manufacturers, such as Little Tykes. The DOE study outlines the current landscape of projects in various stages of development, as indicated in the image below. What we know for sure is that the private sector has and will continue to invest billions into this region, which has generated hundreds of millions in taxes and support for local communities, and provided tens of thousands of jobs over the past few years. There has been no other industry, without exception, that has lifted the Appalachian region like the oil and gas industry. 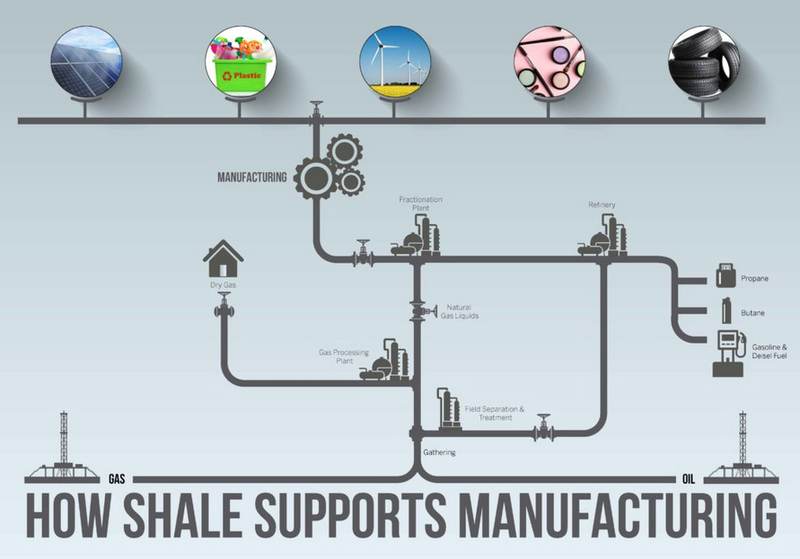 And, if this trend continues toward shale-driven manufacturing, it will be fracking that will be ultimately responsible for singlehandedly creating economic prosperity for a region of the country that has long been forgotten.